I woke up early to visit Nea Makri to venerate the relics of St. Ephraim of Nea Makri, the Great Hieromartyr and Wonderworker. St. Ephraim was a holy monk on the east coast of Attica. Turkish pirates raided the monastery and beheaded the monks, but kept St. Ephraim prisoner for 5 months, torturing him to become a Muslim. In the end, the Godless Turks hung him upside down from a tree and drove a flaming, red-hot stick through his stomache. He contested for Christ 5 May, 1426. Then, he was utterly forgotten for 500 years. On 3 January, 1950, the Abbess of the Monastery, followed a still small voice, and began to dig in a particular spot, which revealed a skull, followed by a heavenly frangrance. 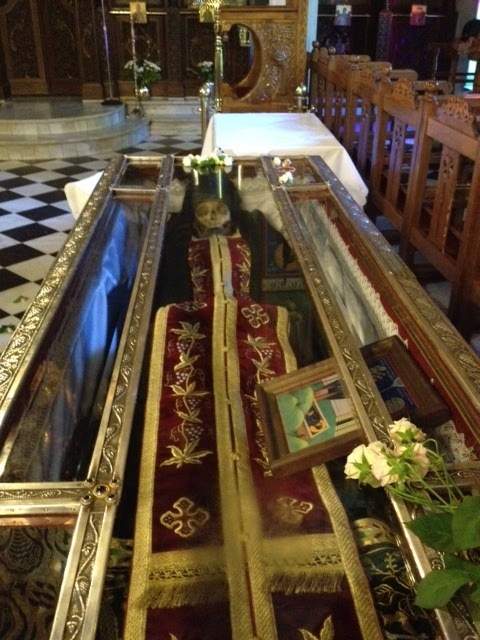 She found the martyr's bones and his raso (habit), which she cleaned. He appeared to her, told her his name, and the story of his life. St. Ephraim has worked many miracles around the world, and has healed countless of people who have asked for his intercessions. Orthodox believe that the saints are alive with Christ, and therefore not dead. In Christ, there is a thin veil between earth and heaven. Christ unites all Christians in the Church, whether alive on earth of alive in heaven. Just as I can ask any of you reading this blog to pray for me, I can ask the saints in heaven to pray for us. Because they are perfected in Christ and are near to him, their pure prayers are quickly answered, as is evidenced by their many miracles, especially of this saint. 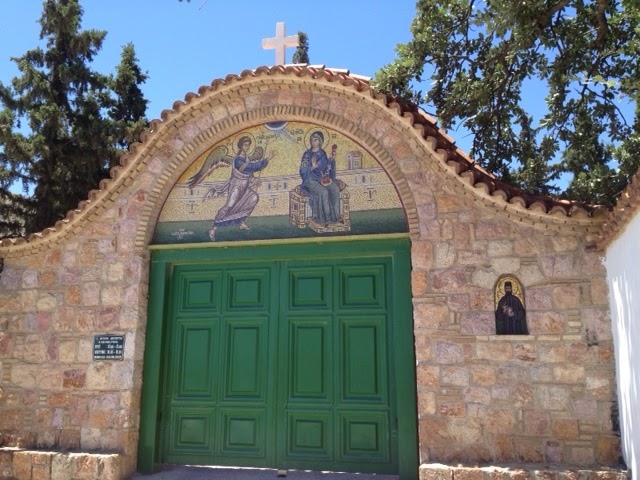 St. Ephraim is well loved by Orthodox all over the world, even America. One particularly moving story involves a teenager (with no religious upbringing) from the midwest who entered what would-have been a deadly coma from a drug overdose, after several other suicide attempts. The doctors told his family that he would probably die, or at best be a vegetable...no chance of recovery. 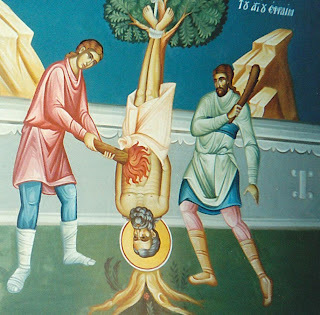 After two weeks, he immediately awoke from the coma, and told the doctors and his family that a radiant monk named Ephraim appeared to him and told that he had been praying for him. God would give him a second chance if he turned his life around. 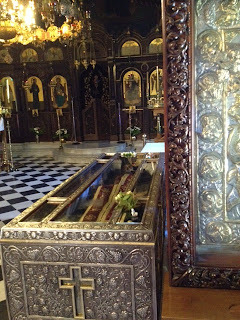 He followed the saint's exact directions to his relics in Greece. 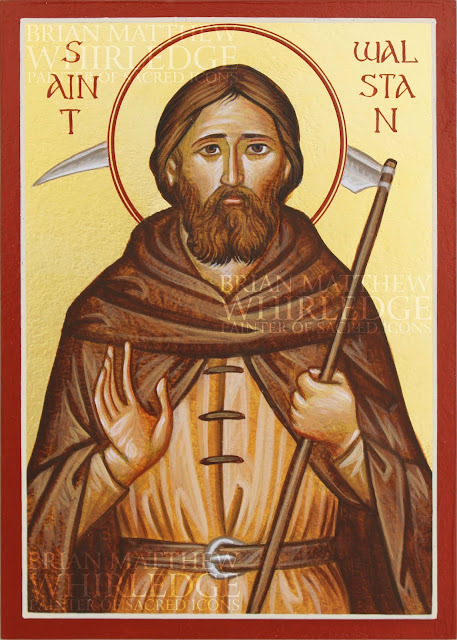 My introduction to this wonderful saint was through my Godfather, who gave me his icon, which I blessed on the saints relics today. I awoke early and grabbed some still warm bread to eat on the way. 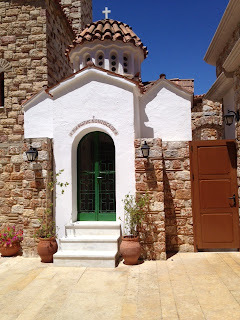 I followed directions given to me by a man named Ioannis at Panagia Rombes a few weeks ago. I took the metro to the airport, getting off at Ethniki Amyna. 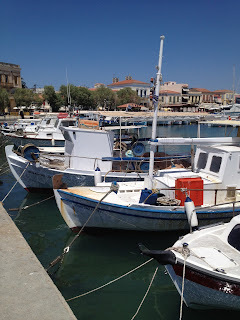 There, I caught the Attiki bus (after waiting half an hour) to Nea Makri, a town about 20 miles from Athens, on the east coast of Attika, on the Aegean Sea, and just south of Marathon (yes, THE Marathon). I was told that the bus would drop me off in the square, where there will be taxis waiting. Just ask the driver to take you to "Agio Ephraim." It worked exactly as described, down to the taxi fare (4 euros). The drive up Amomon Mountain was beautiful. 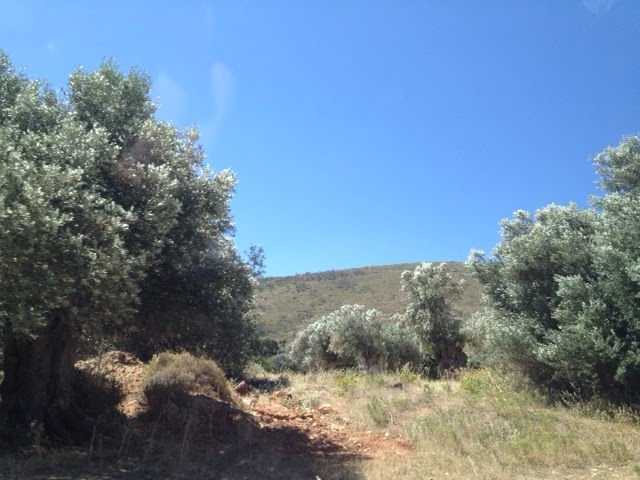 The road was lined with olive trees and the sea was visible most of the drive (I apologize for not getting a better photo). The driver dropped me off at the gate of the monastery and gave me his business card to call for my return. I entered the beautiful grounds of the monastery. There were maybe a dozen pilgrims sitting in the shade around the courtyard. 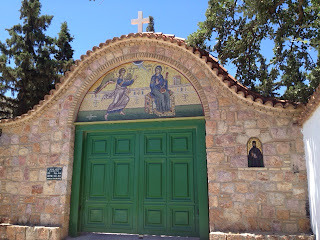 The first site that caught my attention was the chapel over the grave of the thrice-blessed iconographer Photios Kontoglou. The chapel offers pilgrims the opportunity to pray at his grave and light a candle. 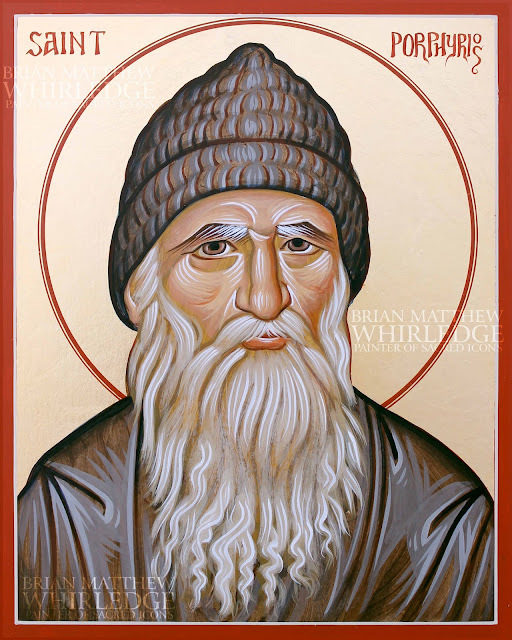 He is popularly venerated, and may one day, God-willing, be declared a saint. As an aspiring iconographer, visiting the grave of Photios Kontoglou is definitely a highlight on my pilgrimage in Greece. Kontoglou pretty much singlehandedly restored traditional iconography to Orthodoxy world-wide in the mid-20th century. For much of the 18th-19th centuries, Orthodox churches used very mediocre baroque/romantic icons. Kontoglou mastered western painting in Paris, before making a pilgrimage to Mount Athos. 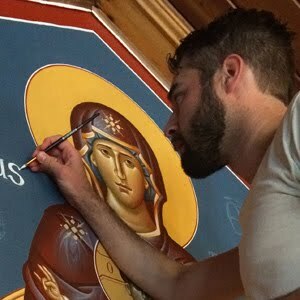 Seeing the ancient icons in Athos inspired him to paint in the traditional style, and spread the traditional practice. The traditional iconographic style is important for many reasons, mainly, it abstracts the subject and shows the saint transfigured in heaven, not the earthly, naturalistic appearance of western art. Indeed, this was the predicament in modern art: artists moved to abstraction to show the true essence that cannot be seen with physical eyes. 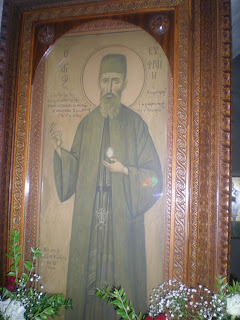 The last icon ever painted by Kontoglou was of St. Ephraim, and is in the church with his relics. 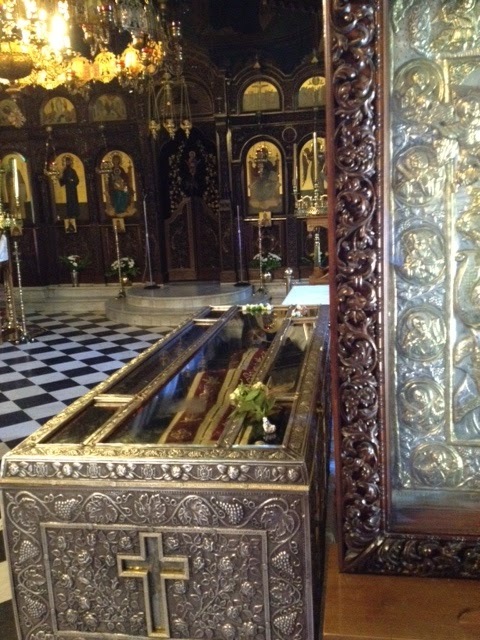 Continuing past Kontoglou's grave, I entered the Katholikon (main church of the monastery). I can't describe with words the holy atmosphere, but I can try. The saint's reliquary is on the right side of the church. It is essentially a silver coffin with a glass top. 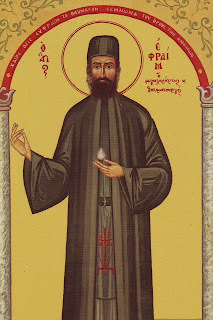 St. Ephraim is vested as a priest-monk, his skull is visible. The glass is covered with flowers left by pilgrims, and icons for the saint to bless. The church was silent with an otherworldly peace that was definitely palpable, but can't be described with words. There were perhaps a dozen people. Some were kneeling at the relics, clutching papers full of names. Others were standing, and most were sitting in a silent contemplation. Some were whispering, and some were weeping. Birds flew in and out of the open doors and windows, their song was the only sound. I can't describe the feeling of my unworthiness as I approached overflowing holiness the saint's body that endured so much suffering for the sake of Christ. 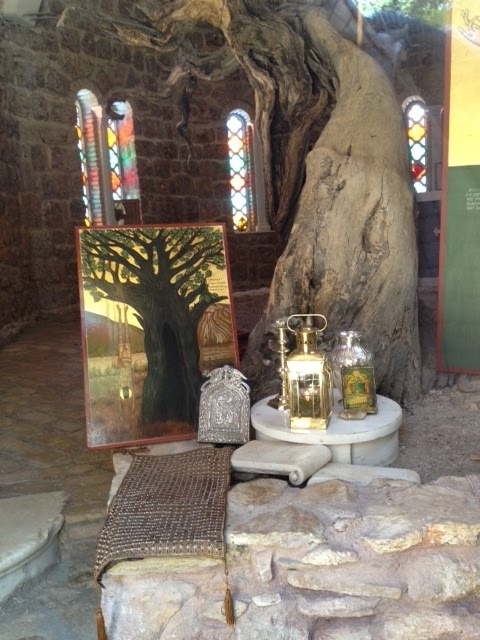 I kneeled before the reliquary, under the crosses made with wood from the tree on which he was martyred. I kissed the glass and added my icons and prayer-rope to the others. I sat with the other pilgrims in silence for a period of time (I'm not sure how long). Suddenly, dozens of people of all ages began pouring in and the silence was interrupted. Among them was a priest who entered the altar, vested, and returned with a censer and prayer book. 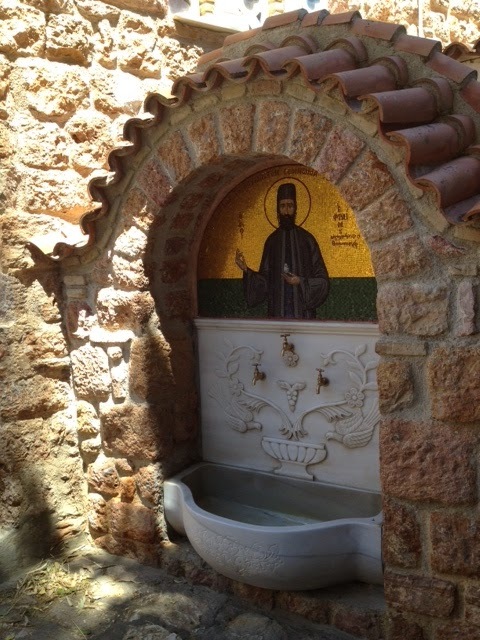 After about a hundred people crowded in, a paraklesis (supplication) service to the saint began. After the service, I followed the people to the courtyard. I found the chapel built around the tree where he was martyred. Someone explained to me the door has to stay locked because so many people have taken pieces of wood from the tree (to be honest, that's what I wanted to do). A miraculous spring comes from the tree. The pilgrims drank from it and I filled a small bottle. I filled another bottle with soil from beside the chapel. This soil was soaked with the martyr's blood 500 years ago. I will put it in my parish church. The people left, and the gate was closed. I called Taso the taxidriver, who quickly arrived, but I had to wait a good half-hour in the town square before the bus came for Athens. 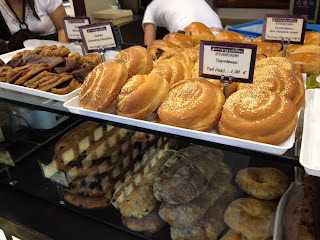 I took the metro an extra stop and walked through the monastiraki flea market district. I found several good coffee-table-books full of beautiful icons. I also bargained down a censer for 10 euros. I stopped at a taverna for lunch. I ordered the "Special of the Day without meat," which the waitress described as "a vegetable that's about this long, green, and looks like a closed umbrella." Okra, right? Innaccurate all around. 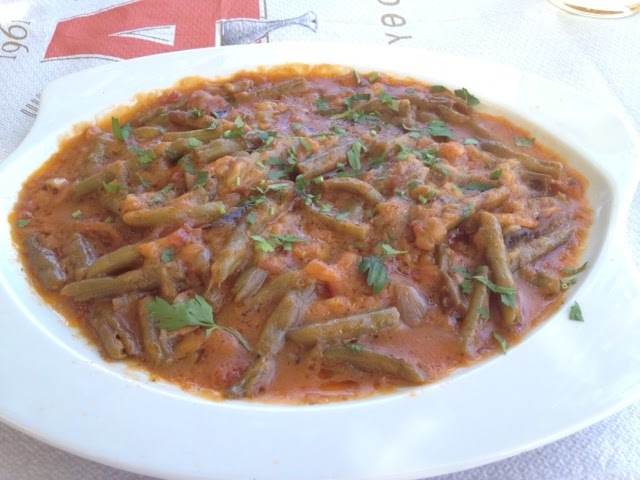 I hope I don't scrandalize anyone, but it defintely wasn't okra, and definitely wasn't vegetarian (green beans in a tomato sauce, with a liberal amount of souvlaki chunks for flavor). I walked to my lesson, where we studied plagal first (a "minor" mode starting on the 6th), and third mode. Third mode was the favored mode for singing battle songs as the ancient phalanxs marched. "Byzantine" chant is really quite innaccurate: it's simply music, and has been around for thousands of years. The whole Roman world shared it, so it was organically used by the church. All folk music uses these same scales and modes to some degree or another. On my way back to the apartment, I found a couple of great coffee table books on the beautiful island of Naxos. Coffee-table books are great because images transcend the language barrier. I MADE TO TO CHIEF IN 6 MONTHS.